This play did not result in a sack. Over their last three games, the Philadelphia Eagles defense has one sack, for a grand total of zero yards lost. Over the last two games they don't have any sacks, and on Sunday against the Bengals, they only managed to hit quarterback Andy Dalton once. The defensive line, once thought to be the strength of the Eagles' roster, has not played anywhere near up to expectations. Among the reasons given for the lack of pass rush production in recent weeks was that opposing quarterbacks are getting the ball out quickly, thus negating the Eagles' pass rush. That excuse was once again offered in the locker room after the Bengals game by Fletcher Cox. 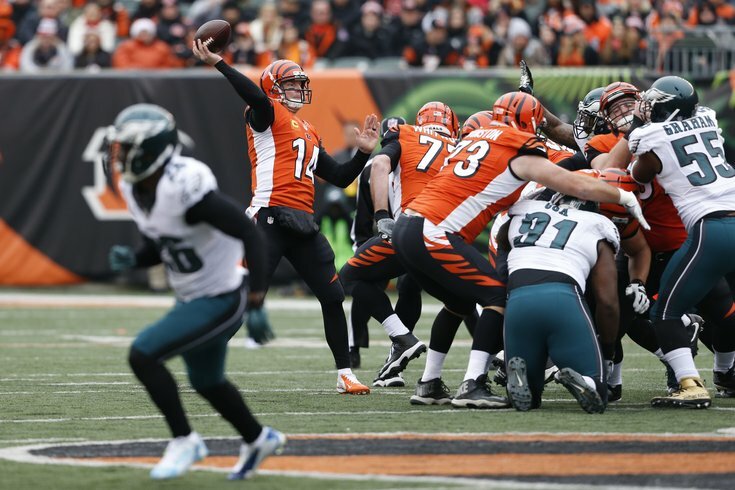 The Bengals absolutely did not run a "dink and dunk" offense Sunday against the Eagles. There were certainly some quick-hitter throws on occasion, but Dalton took shots down the field regularly, and averaged a lofty 10.7 yards per attempt. On average, he took 2.65 seconds to throw, which is right around a reasonably normal amount of time to throw. Furthermore, by my count, the Bengals kept seven players in to block just three times. They most certainly were not showing max protect looks all day. The Eagles' pass rushers got opportunities to to pressure Dalton on Sunday, and they simply just did not beat their blocks.